Negeri Cantik, Budaya Menarik – Beautiful State, Beautiful Culture - That’s the tagline for the recent Visit Terengganu Year 2013. Perfect words to describe Terengganu, a state on the East Coast of Peninsular Malaysia. For this instalment of "Top Things to Do and See..." with a local perspective, Ramble and Wander has invited Fashran Fauzi of Fashran Travels the Globe, a Malaysian travel blogger who originally hails from Kuala Terengganu, to share with us some insights about his hometown. You should not leave Terengganu without tasting this authentic nasi dagang with gulai ikan tongkol. This humble breakfast spot serves authentic nasi dagang which is the best so far in Terengganu. Just forget the commercialised and expensive ones that you’ve read in other blogs or even heard on the news. Nasi Dagang Warisan is worthy of your visit. This little breakfast stall is also famous for their special menu of half-boiled kampung chicken egg with honey. This is one of the breakfast spots that I look forward going to every weekend ever since I was 8 years old! Up until today, their roti canai with fish curry is my all-time favourite and not to be missed every single time I’m back in Kuala Terengganu. Other than that, their lip smacking nasi lemak and nasi dagang are also the reasons why the locals keep making their way to this restaurant since forever. This famous restaurant in Kuala Terengganu is well worth a visit. They serve a variety of Terengganu local lunch dishes such as ayam kampung and ikan baung. The way they serve their lunch dishes is very unique in that the staff will stack a variety type of dishes on your table without you needing to place any order. You however get to choose which ones of those dishes you’d like to have, and of course, pay for those only. This is another "signature" restaurant in Kuala Terengganu where you can see a good crowd especially during lunch hour. The concept at this restaurant is more or less the same with Restoran Mat Binjai as they serve nasi berlauk. I’ve been going to this place since I was in primary school and until today, their food tastes just as good. My favourite dishes here include sotong sumbat masak lemak and nasi kukus sotong. This is one of the best places to satisfy your cravings for Terengganu dishes. Yee Stall is well known for its Western food. From lamb chop to spaghetti, this place offers quality Western food at economical price. I however normally go to this place for its aiskrim goreng, the original fried ice cream. The story goes that the owner invented it when he was a chef at Primula Beach Resort, one of the first hotels in town, and such, started the history of fried ice cream in Malaysia. This might just be a rumour but I can tell the difference between the stall’s fried ice cream and the commercialised version. It is so much more delicious! Seberang Takir, located just across Terengganu River from the town centre, is famous for its seafood. You can find a variety of stalls offering local seafood products and food along the coastal road of this area. Ikan Celup Tepung, or popularly known as ICT among the locals, should be on your to eat list when you’re in Kuala Terengganu. Among the many stalls offering ICT, I think Warung Pok Nong has the best seafood. You just name it, fish, squid and even prawn, everything tastes crunchy and fresh, and I just can’t get enough of them. This place actually has no name, but the locals call it ‘Aji Roti Canai Tanjung’. Located in one corner of Tanjung shoplots next to Astaka (current Seng Heng store), this is another hidden gem for food hunters. It is a very old school mamak place that serves awesome roti canai starting from evening until midnight. This place has been a favourite shop of my dad and his siblings since their younger days. They said the shop has been there since 1980s and was inherited by the family. They serve soft and crunchy bread menus, from simple roti canai to murtabak. If you’re a fan of gulai kambing, make it a point to come here. It is another favourite spot for supper for local folks. A simple roti tempayan (similar to naan bread) with gulai kambing would definitely blow you away. It’s such a great combination with a hint of smashing lamb gravy. You would not regret trying it, I can assure you that. When you talk about Terengganu, the first thing that will usually pop in your mind is keropok lekor. For me, which keropok lekor is the best depends on individual preference. Some might like it thin while some others might like it thick. The best thing is to go and try it yourself because keropok lekor anywhere in Terengganu are mostly tasty and made from fresh fish. That's the reason why I have not included any recommended place to get good keropok lekor as you can get good ones almost everywhere in Terengganu. 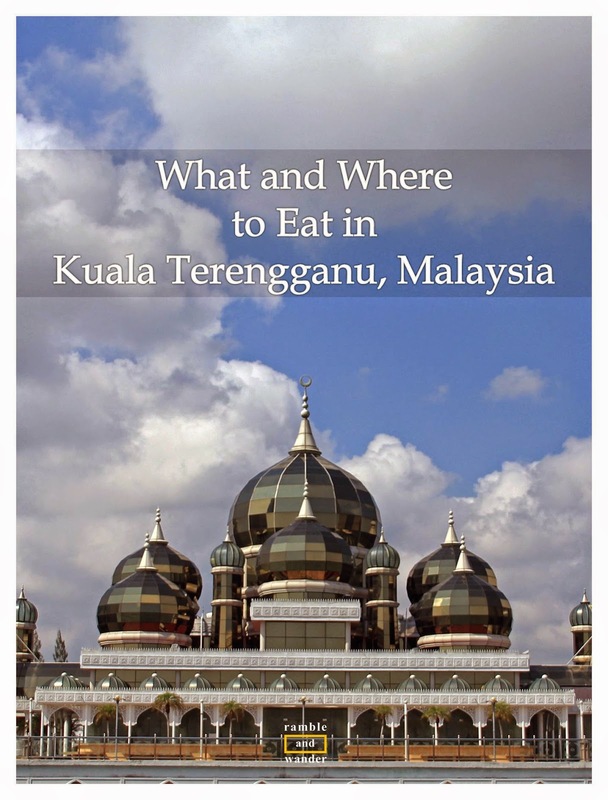 Anyways, I hope this list of my top favourite eating spots in Kuala Terengganu could be a short definitive guide when you’re next in Kuala Terengganu. Obviously there are more treasures to be found in this beautiful state so if you have any other recommendations, please do share it with us. 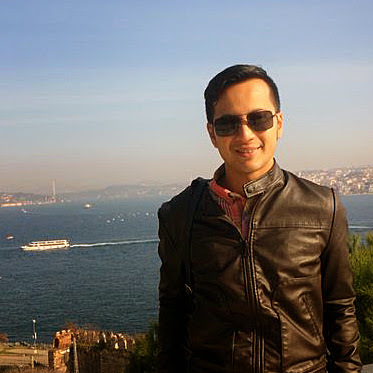 Fashran Fauzi hails from Kuala Terengganu but these days he lives and works in Kuala Lumpur. A young executive who is passionate and enjoys going on road trips and jet-setting around the world, he travels using the money that he’s earned. (Well, at least that’s what he claims on his blog! Heh! ;) ) You can read all about his travels at Fashran Travels the Globe. In conjunction with Visit Malaysia Year 2014, Ramble and Wander would be inviting fellow Malaysian travel blogger friends to share their knowledge and insider info, through a guest post, about places and things they would personally bring their guests to see, do and try in their local area. This is the second of such guest post. nice. for nasi dagang..also can go to stall Kak Pah kat pantai batu buruk..beratur panjang giler even kul 8pagi. taste not bad..and yg penting lauk dia - ikan- banyak giler. hehe. Haa! Nasi dagang Kak Pah pun pernah dengar tapi tak pernah cuba lagi. Dekat dgn Taman Selera Batu Buruk tu jugak kan? ah..dh masuk JJCM rupenye kak pah neh. hehe. anyway..bazar kuih gong kapas is another place shud go as here can find banyak kuih muih tradisi terengganu. ever heard the kuih belimbing? once used to have the privilege as 'kuih istana' like puding raja pahang...hehe. Oh yeah, kuih belimbing is one of my favourites! I'm originally from KT but didn't know that it was a kuih istana. Bazar kuih tu is quite famous nowadays, almost becoming an institution already, haha! This is definitely a mouth watering blog post. Talking about Nasi Dagang, watched Jalan Jalan Cari Makan (JJCM) on TV3 last weekend and they reviewed on Nasi Dagang Kak Pah in Batu Buruk (as mentioned by Agip above). Yeap, it's located at the Medan Selera Batu Buruk (middle shop). I bet, it's one of the best in KT too! And we had the same storyline / rumours on how the fried ice cream was originated. Mum's and Uncle's told me when I was still in primary school since we used to stay all the time in Primula Resort those days. I was first introduced to fried ice cream in Kuala Terengganu itself! I could't accept the new invention kind of fried ice cream in the market now. Another fav food spot of mine is definitely Nasi Ayam at Restoran Darul Iman (in front of Sek Men Agama Atas Sultan Zainal Abidin). Addictive! Not sure whether the kedai tue masih beroperasi ke tak. If it's at Medan Selera then it's close to Yee Stall as well then. I have to give all these a try the next time I'm back in town. Never heard of Restoran Darul Iman before, haha! But based on the location you've given, I think it's close to a small bakery known for its "roti hospital" maybe. Haaaa? Sekali je?? *saja drama sikit* Terengganu memang ada banyak makanan & kuih muih tradisional tapi yg popularnya tetap nasi dagang dgn keropok lekor. Eh! Dah mula kerja ke belum ni? Haha! Kalau dah mula kerja di Pahang senang la nak ke sana, dah dekat. Negeri DYMM Tuanku Sultan Mizan, heheh! Restoran Soto Seksyen 8 tu ada jual nasi dagang tapi nasi dagang Kelantan. Kalau nasi dagang Terengganu, tak tahu la mana nak cari kat sebelah sini. Have always wanted to come here (and Kota Bharu) but it's such a chore to get to from SG! terengganu memang antara syurga makanan. rugi kalau tak datang mencuba semua makanan tradisi kat sini. Betul tu. Saya sendiri asyik pening kepala bila nak kena pilih nak makan apa di sana sebab terlalu banyak pilihan yg menarik.